Lutetium oxide was described independently by several different chemists in 1907: Georges Urbain in France, Carl Auer von Welsbach in Austria, and Charles James in America. All were working with an impure sample of ytterbium oxide. Urbain’s name for the new element contained in the oxide was based on the Greek name for Paris, and was the name ultimately retained for the element. Lutetium is extremely rare, but does have a few commercial uses. It is added as a dopant to garnets used in speciality lenses and magneto-optical memory storage devices. Cerium-doped lutetium oxyorthosilicate (LSO) is one of the most effective materials for detectors in positron emission tomography (PET) scanners. Small quantities can also be used as catalysts in petroleum cracking and other industrial chemistry applications. Lutetium tantalate is the densest known stable white material that can be used as a host material for X-ray phosphors. Lutetium can also serve a dopant in a number of phosphors and scintillator crystals. Radioactive lutetium isotopes are used in radioactive dating and experimental cancer therapies. Lutetium is a rare earth element and can theoretically be found in any rare earth containing mineral, but as a heavy rare earth element (HREE) it is more common in HREE-enriched minerals such as xenotime and euxenite. Additionally, lutetium is present in ion adsorption clays, which are a major source of HREEs due to their relative ease of processing, despite the low percentage quantities of rare earths they contain. Lutetium is the ideal host for x-ray phosphors because it produces the densest known white material, lutetium tantalate (LuTaO4). It is utilized as a dopant in matching lattice parameters of certain substrate garnet crystals, such as indium-gallium-garnet (IGG) crystals due its lack of a magnetic moment. Lutetium is available as metal and compounds with purities from 99% to 99.999% (ACS grade to ultra-high purity). Elemental or metallic forms include pellets, rod, wire and granules for evaporation source material purposes. Lutetium oxide is available in powder and dense pellet form for such uses as optical coating and thin film applications. Oxides tend to be insoluble. Lutetium fluorides are another insoluble form for uses in which oxygen is undesirable such as metallurgy, chemical and physical vapor deposition and in some optical coatings. Lutetium is also available in soluble forms including chlorides, nitrates and acetates. These compounds can be manufactured as solutions at specified stoichiometries. Lutetium is a Block F, Group 3, Period 6 element. The number of electrons in each of Lutetium's shells is 2, 8, 18, 32, 9, 2 and its electron configuration is [Xe] 4f15 5d1 6s2. In its elemental form, CAS 7439-94-3, lutetium has a silvery-white appearance. 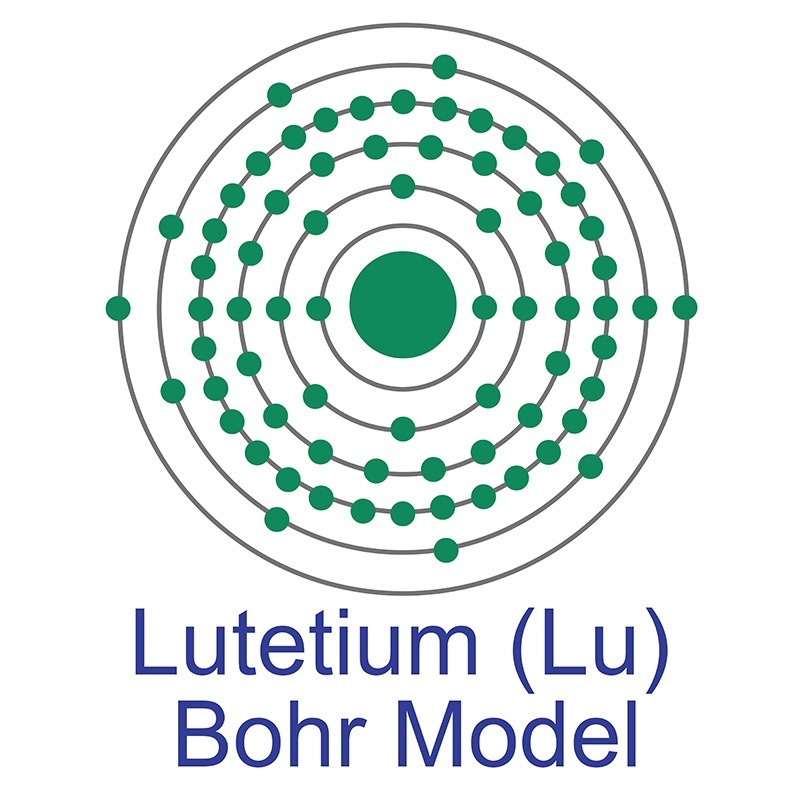 The lutetium atom has a radius of 171.8.pm and its Van der Waals radius is 221.pm. Lutetium is the last member of the rare earth series. Unlike most rare earths it lacks a magnetic moment. It has the smallest metallic radius of any rare earth and it is one of the least abundant of the naturally occurring lanthanides. The most common source of commercially produced Lutetium is the mineral monazite. Lutetium was first discovered by discovered independently by several different chemists, all in 1907. The name Lutetium originates from the Latin word Luteti, a historic name for Paris. Lutetium is not toxic in its elemental form, however, safety data for lutetium and its compounds can vary widely depending on the form. For potential hazard information, toxicity, and road, sea and air transportation limitations, such as DOT Hazard Class, DOT Number, EU Number, NFPA Health rating and RTECS Class, please see the specific material or compound referenced in the Products tab. The below information applies to elemental (metallic) Lutetium. Extinguishing powder. Do not use water. Naturally occurring lutetium (Lu) has 1 stable isotope, 175Lu.